The initifada is still carrying on, yesterday it reached the suburbs of the capital Tunis, and troops were deployed on the streets for the first time. Ben Ali has belatedly tried to signal changes by sacking his interior minister and promising that he will start a programme to create 300,000 jobs in the next two years. But members of his family have been reported as fleeing the country. Where can i read about the links between the Ben Ali regime and the CIA? Are there any texts available online? I'm not aware of any but if I find anything I'll post it here. Is it possible the US government doesn't want its citizens to get ideas, or is that a little too far of a stretch? Seems like the world's rulers want to get rid of Ben Ali - for the first time on French news yesterday night, Tunisia was the main item - and over 5 minutes on it, though half was about the reaction of the powers-that-be; the ideology was that the movement was "advancing" from a social conflict to a political conflict, Newspeak for "let's try to repress the social aspect of this conflict and divert it into hierarchical political solutions". From now on, probably lots of talk about democratisation. 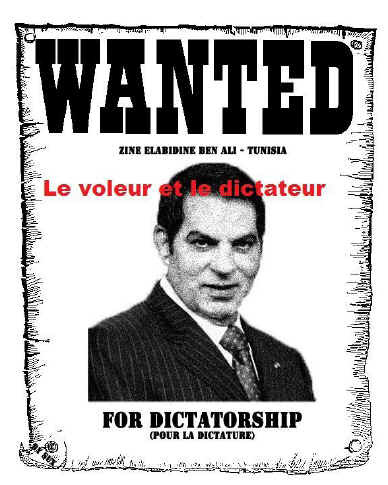 I'd guess Ben Ali's pretty much finished - the fact that they're releasing those arrested in the uprising is an indication of incredible fear and weakness on the part of the ruling elite. In the thread Mark. mentioned they were also releasing criminals from prison to act as hired thugs against the uprising, and also that those protestors involved in fires or looting would not be released. Seems like either way some people are being released from prison, but who they are and the reasons for it is contested. Yeah, definitely looks like the wall of silence is completely broken in the French media, it's on the front page in both le Monde and le Figaro. But as Satmonaf said, in a "the revolt has now transcended the merely economic to attain a higher political character" discourse. edit: then again, le monde are still running pieces entitled "Face à Ben Ali, le "grand silence" de la France" (Faced with Ben Ali, France's "big silence"), and a government minister (Luc Chatel, Education) said on morning radio ""la France n'a pas à s'ingérer dans les affaires de la Tunisie" (France should not be intefering in the affairs of Tunisia). So not all traces of the "looking the other way" programme have yet completely disappeared. those protestors involved in fires or looting would not be released. Didn't see that - the media discurse here din't mention this significant exemption, presumably because looters and burners are beneath contempt in their eyes, and aren't worth mentioning; nevertheless, presumably those who threw rocks and stones at the cops are being released (?). Luc Chatel, Education... said on morning radio ""la France n'a pas à s'ingérer dans les affaires de la Tunisie" (France should not be intefering in the affairs of Tunisia). What they say and what they do are 2 different things; they've still got to get on with Ben Ali's regime, even if they're trying to think of ways of replacing him with some racket more capable of calming the situation. And news is just out of a French guy, a teacher in France of Tunisian origin, on holiday there who's just been killed by the cops on a demo, so the French State is kind of forced to 'interfere' now (as if they haven't always had an influence there, anyway). They can't let a French national be kiled by a foreign state's cops without making some protest or other. Even if the guy is only an Arab (racist irony intended). No. It's even better than that. The full version I saw quoted in one of the news stories (sadly I didn't note where) was "all those imprisoned because of the disturbances are to be released... [wait for it!] ...apart from those guilty of criminal offences". Kafka eat your heart out. In practice the promise about not shooting any more people will probably be the more immediately verifiable/falsifiable one. Yet despite the president's announcement that live ammunition would not be used, Al Jazeera learned that three more people were killed in Aouina, a suburb of Tunis - less than an hour after the president's speech. "I couldn't understand because the president just said that they'd stop using live ammunition, but they still shooting people," the witness told Al Jazeera. The young man said that he heard screaming outside his apartment and discovered that that police had just shot three people. Despite the president's speech, he said the protests and police violence was continuing, as it had the previous night. Iraqi Kurdistan or Kurdistan Region (Kurdish: Herêmî Kurdistan; Arabic: Iqlīm Kurdistān) is an autonomous region of Iraq. It borders Iran to the east, Turkey to the north, Syria to the west and the rest of Iraq to the south. The regional capital is Arbil, known in Kurdish as Hewlêr. The region is officially governed by the Kurdistan Regional Government. The establishment of the Kurdistan Region of Iraq dates back to the March 1970 autonomy agreement between the Kurdish opposition and the Iraqi government after years of heavy fighting. The Iran-Iraq war during the 1980s and the Anfal genocide campaign of the Iraqi army devastated the population and nature of Iraqi Kurdistan. Following the 1991 uprising of the Iraqi people against Saddam Hussein, many Kurds were forced to flee the country to become refugees in bordering regions of Iran and Turkey. A northern no-fly zone was established following the First Gulf War in 1991 to facilitate the return of Kurdish refugees. As Kurds continued to fight government troops, Iraqi forces finally left Kurdistan in October 1991, leaving the region to function de facto independently; however, neither of the two major Kurdish parties had at any time declared independence and Iraqi Kurdistan continues to view itself as an integral part of a united Iraq but one in which it administers its own affairs. The 2003 invasion of Iraq and the subsequent political changes led to the ratification of a new Constitution of Iraq in 2005. The new Iraqi constitution defines Iraqi Kurdistan as a federal entity of Iraq, and establishes Arabic and Kurdish as Iraq's joint official languages.